The Tunnels in Bristol was a new venue to some of us but well worth the trip as it is ideal for this sort of event. Unsurprisingly it is indeed a set of tunnels that run underneath Temple Meads railway station and because of this is not the easiest place to fine on a dark, wet Thursday evening but we got there and I think all in attendance would agree that the effort was well worthwhile. Several times during this excellent 75-minute set Andy Tillison mentioned how nervous he was feeling: playing as a duet with long-time collaborator Guy Manning, following the disbanding of the current version of The Tangent just a couple of weeks before this tour, left him feeling vulnerable and exposed on this, the first night of the tour. Neither he nor Manning need have worried, for the material they presented was of such high quality that, even in these pared-down versions, there was plenty to enjoy. In fact, despite the fact that The Tangent’s recent live performances had wowed audiences, being able to witness these two friends performing in such a novel format carried much appeal. This was immediately evident from the set opener, which was Parallel or 90 Degrees’ Dead on a Car Park Floor, which elicited an enthusiastic response from the crowd. The inherent melody of The World That We Drive Through means that it can never be anything other than sublime and the duo then continued by demonstrating their eclecticism with the Tangerine Dream-inspired After Phaedra, Tillison explaining that it was the only number in the set that would incorporate an element of pre-recorded work, everything else would be live playing. The surprises mounted, with Tillison joining Manning on acoustic guitar: they played a fine rendition of The Tangent’s The Company Car, with Tillison providing the rhythm work whilst Manning played some very fine twiddly-bits! 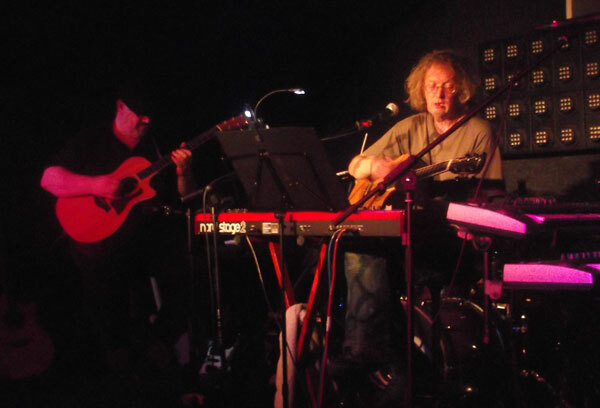 With the pair both still on acoustic guitar, we were then treated to In Swingtime, which features on Manning’s recently released Akoustik album. Tillison then left the stage, leaving Manning to perform Margaret Montgomery and The Candyman solo. Prompted by thoughts of how friends of his were faring in New York during hurricane Sandy, Tillison changed his mind about what to perform during his own solo spot at the last moment, choosing to play Palimpsesting Gershwin on digital piano, an unpublished song with, as the title suggests, a slightly jazzy, Gershwinesque feel. Manning rejoined Tillison for The Music That Died Alone, another of The Tangent’s timeless classics whose melodic highlights can win over the hardest of hearts. The surprise during this particular rendition was a “drum solo” played by Tillison on one of his keyboards: I normally hate drum solos but this was rather special! 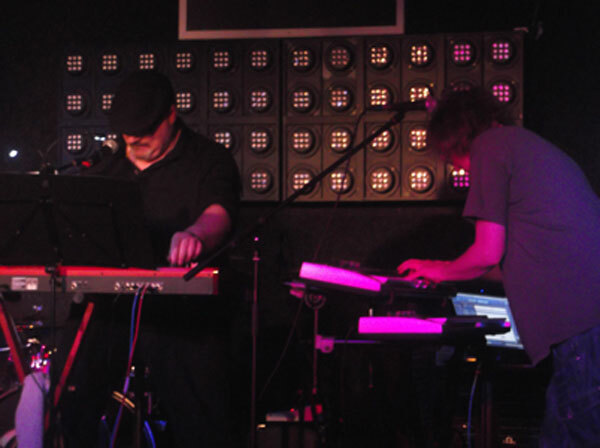 As a finale, the duo played a version of Van der Graaf Generator’s Man Erg, which was given an impassioned vocal from Tillison. Sadly, this had to be foreshortened due to time pressure. This varied and very well-received set demonstrated what fine songwriters and musicians Manning and Tillison are, quite capable of holding an audience in thrall even under the difficult circumstances caused by The Tangent’s disbanding. Their fans were certainly not disappointed to have ventured out on this rainy night and will now be looking forward to the next instalments of their careers. With the recent news about the end of the last line up of The Tangent there was a mood of anticipation about tonight’s concert. Andy Tillison and his good friend Guy Manning agreed to honour the date/tour and this promised to be interesting and a delight. Well did this two man version of The Tangent deliver? I would certainly say so. They provided the audience with a classy and exciting run through of The Tangent, Parallel or 90 Degrees and Manning catalogues plus a Van der Graaf Generator song. The show began with Po90’s Dead on a Car Park Floor which proved an exciting opening, both set up with keyboards but Guy mostly playing Guitar. This was followed by The World That We Drive Through which took on a different feel played in this way without a full band. The between song banter continued before they played the Manning song In Swingtime, this being one of my favourites from them, and they did not disappoint. Andy gave a little introduction to the next song by telling the audience about some of Peter Hammill’s experimental (at the time) ways of creating music which led into a tribute to the musical style of Tangerine Dream called After Phaedra and what a treat it was. I have never seen TD live but after this I did not care as it was really well constructed and played. Andy then introduced Guy and left the stage while Guy related crazy and funny songs that his Grandfather used to sing followed by two of his own, The Candyman and Margaret Montgomery. He then swapped places and Andy took the stage and played a song about New York based around George Gershwin’s influences called Palimpsesting Gershwin. Guy returned to the stage and an excellent version of The Music That Died Alone followed leading to the end of the show. Andy announced that they had been playing an onstage game set by their tour manager to say three words each on stage. Guy had done his during his story telling before The Candyman, so Andy gamely attempted to get his said with Guy counting them out. He also invited the audience to give words to the tour manager ready for tomorrow night’s gig. To end they played a wonderful but shortened version of VdGG’s Man Erg and then it was all over. This was an excellent gig presented and played by two great professionals who clearly enjoy what they do. I wish Andy well as I know that The Tangent will rise again, to deliver more high class progressive music. Professionalism - pro•fes•sion•al•ism, [pruh-fesh-uh-nl-iz-uhm] – Noun: the standing, practice, or methods of a professional, as distinguished from an amateur. With the recent implosion of by far the best version of The Tangent to grace us since Andy Tillison formed the band over a decade ago (and that’s saying something) this set of gigs supporting IO Earth appeared to be in doubt but with a huge dose of the aforesaid professionalism Andy and Guy teamed up to ensure that the show went ahead and in the process gave us something really special to celebrate their working relationship over 25 years. Given the short time that they had to prepare for this they did an excellent job and it was a joy to watch this first show of the tour. Given the surroundings Andy felt it right and proper to give us some history regarding Bristol Temple Meads station (designed by Brunel and opened in 1840) before a wonderful opener in the shape of Po90’s Dead on a Car Park Floor which they followed up with The World That We Drive Through. With Manning sitting behind a keyboard alternating with acoustic guitar and Tillison to his left in his usual side on position they rang out every ounce of emotion, these stripped down versions showing what truly great songs they are. The humour between the two was as endearing as always with Guy informing us in his usual self-deprecating way that the set was about to take a nose dive with a version of In Swingtime from his Tall Stories album. This may have been due to his concerns over the height of the stool he was sitting on but all was well and we got a great version of one of my favourite songs from Guy’s extensive catalogue. Eclectic - ec•lec•tic, [ih-klek-tik] – Adjective: made up of what is selected from different sources. Andy explained that their intention on this tour was to use the keyboards and technical rig in keeping with a concept Peter Hammill employed for his And Close As This album where the songs were recorded live in the studio by triggering all of the instrumentation in one take. Tillison wanted to do this live and with the aid of his trustee laptop was able to add bass and drums where required. The bass was missing to begin with but when this was rectified the results were impressive. 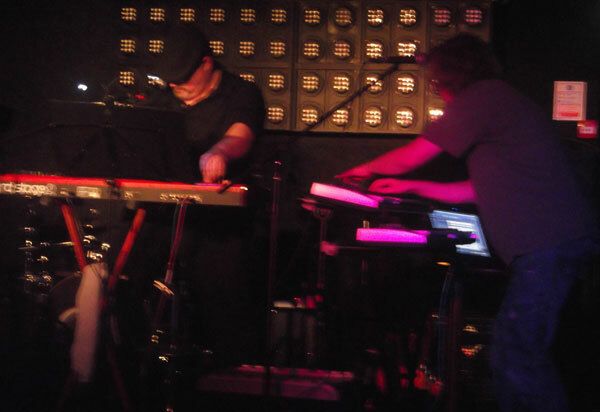 Programmed analogue keys then brought us the Tangerine Dream influenced After Phaedra which worked very well and added a new facet to what was becoming a very eclectic set. Palimpsest - pal•imp•sest, [palimp?sest] - Noun: something reused or altered but still bearing visible traces of its earlier form. It was odd to see Andy strapping on an acoustic guitar as the duo gave us The Company Car from the Down and Out in Paris and London album, a track never previously performed live, before Guy’s solo spot featuring Margaret Montgomery and The Candyman. Andy’s solo spot followed with an unrecorded piano song inspired by New York, Palimpsesting Gershwin which was quite lovely and I look forward to it appearing in some form in the future. Halibut - hal•i•but, [hal-uh-buht, hol-] – Noun: either of two large flatfishes, Hippoglossus hippoglossus, of the North Atlantic, or H. stenolepis, of the North Pacific, used for food. So where do you go after a tasty sandwich of talent and humour with a topical garnish between a couple of slices of education? Why a long cool glass of nostalgia should do the trick and this we got in the form of the title track to The Tangent’s debut, The Music That Died Alone, including an unexpected 'drum solo' from Tillison, followed by a shortened by necessity version of Van der Graaf Generator’s Man Erg to loud applause. After the drum solo Andy threw a drumstick into the sparse crowd and there was much hilarity as it clattered across the floor. Towards the end of the set Andy informed us that, instigated by our very own Brian Watson, they had been challenged to slip three words each into the evening’s banter. Guy had successfully used ‘greenhouse’, ‘eject’ and ‘void’ early on so at 3 nil to Manning Tillison fought back to tie the match at the death with ‘halibut’, ‘moribund’ and ‘vacuum’. Good work both, time for a slice of orange in the dressing room. Noticeably no one was pulled off at half time. Entertainment - en•ter•tain•ment, [en-ter-teyn-muhnt] – Noun: 1. the act of entertaining; agreeable occupation for the mind; diversion; amusement. 2. something affording pleasure, diversion, or amusement, especially a performance of some kind. Enjoyment - en•joy•ment, [en-joi-muhnt] – Noun: 1. the act of enjoying. 2. a particular form or source of pleasure. 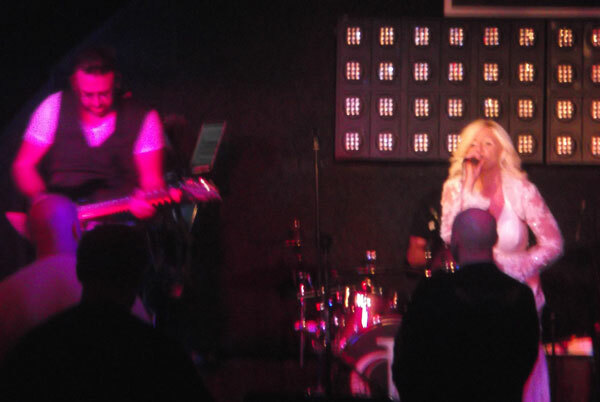 Dave Cureton and his band made a big impression on me with their set at Summer's End in 2009 and having released their second album, Moments, earlier in 2012 I was looking forward to seeing them again. They appeared to warm applause and launched into the title track from the new album, one of 6 tracks played from Moments, with a well balanced set that was almost equally split between the two albums and featured most of the obvious highlights. Singer Claire Malin made her entrance dressed all in white, her powerful voice one of the highlights of the show. The band was very tight and the songs, written by Cureton and guitar/keyboard man Adam Gough, are all very good with both albums having rightly received 9 out of 10 ratings on DPRP. IO Earth have certainly come on as a live unit since 2009 as a result of numerous gigs and they have become a punchy and powerful band not so reliant on Dave Cureton who as well as being an engaging frontman also possesses superb playing skills but as good as Cureton is it is the sporadic use of Malin and the tenor sax and flute of Luke Shingler that give IO Earth the edge. The material features emotional ballads and sure-footed instrumentals and the excellent sound tonight made them all shine brightly, the band playing with passion and enthusiasm. The Eastern flavoured passages here and there and Shingler’s contributions move the material away from the run of the mill and the band put it all across well with power and precision. Various musical elements and genres are brought together to produce the unique sound with Dave Cureton central to it all with some quite stunning guitar work. The set developed and didn’t get bogged down, flowing from start to finish as a complete whole. A costume change from Malin to a black dress and use of a mask gave the set a theatrical edge at times and varied things up nicely and the well deserved encore of Harmonix was a fine way to end. The band gave their all to a warm reception but as is often the case where were the punters? It is getting harder and harder for live music events to draw a crowd, particularly mid-week, but you can’t blame the bands for that as this was a compelling evening of fine music delivered with passion in a lovely setting. What else can they do? Answers on a postcard.